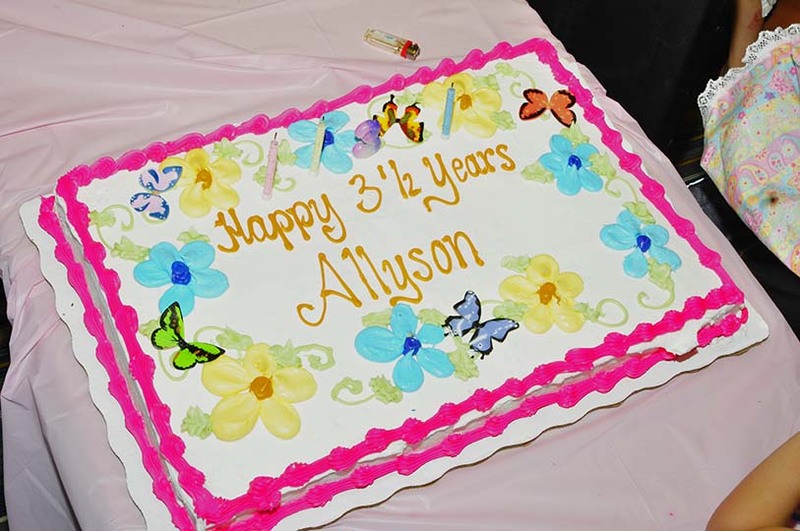 Ally’s 3 1/2 Birthday Celebration, August, & MDA Events coming in Sept.
Once again, I’m very behind on Ally updates — but at least I have some pics and good news. 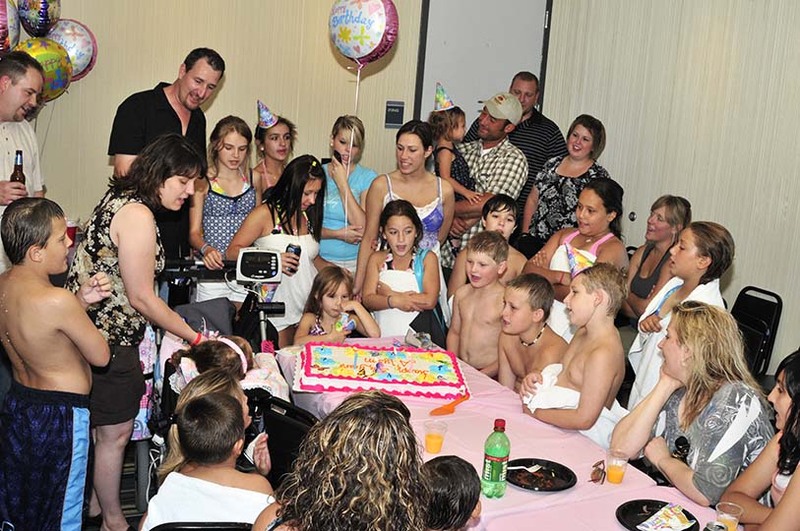 Ally had an absolutely WONDERFUL 3 1/2 Birthday Celebration on August 2nd 2009! A huge thanks to family and friends who were able to make it (about 75 people total and even her Uncle John and family from IA came). 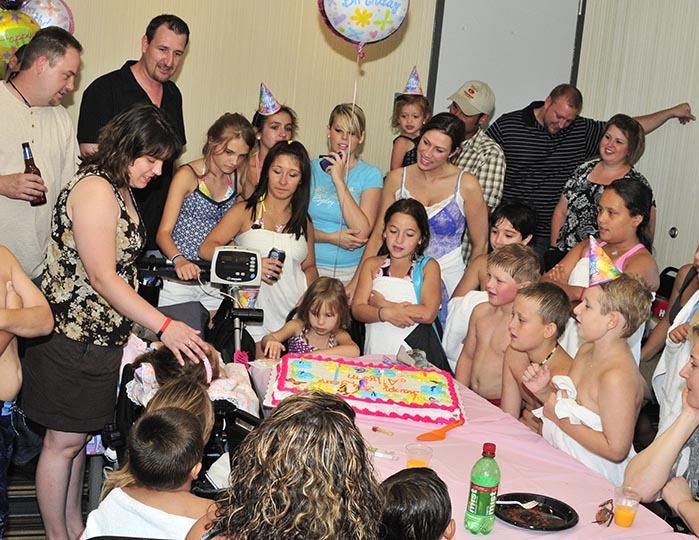 Thank you to those that sent cards/donations to the Angel Allyson Fund NFP, and thanks to those who were there in spirit. The weather was perfect and it was an amazing day of celebrating Ally and the friendships and support we have from so many who care about Ally and our family. An extra special thanks to Mama K (Kathy Kosla), my mom, my sisters, and all who helped to make the day turn out so well. We had a really nice raffle with some great prizes, it was a wonderful day for swimming and there was even a Martial Arts demonstration/activity for the kids. After Ally’s Birthday, things settled down quite a bit around here. Summer school ended and for August Ally only had art, music and speech about 1x each a week. We did our own PT and OT with the help of Ally’s nurses. She got her new braces (TLSO, hand splints and AFO shoes). Some fun activities included going to Madison for SMA Education Day, attending the Wiggles Concert with Nolan (6 1/2 years old with type 1 SMA), Melissa had gymnastics camp for 1 week and Kristyn started cheerleading. We also attended another MDA Golf Event/Luau that I spoke at and an MDA Luncheon Lock Up at the Sears Tower (now the Willis Tower). This is actually pretty calm for us. I’ve actually been a little low on energy (having lots of lazy days) and luckily have had a lot of help from Billy, my mom and our nurses. This happens to me once in awhile, but I’m finally regaining my motivation and energy. Sorry if I’ve been a little behind on phone calls and emails. Ally’s thank you cards will also be in the mail tomorrow – sorry for the delay. Only one more week and ALL three girls start school on Tuesday, September 8th. 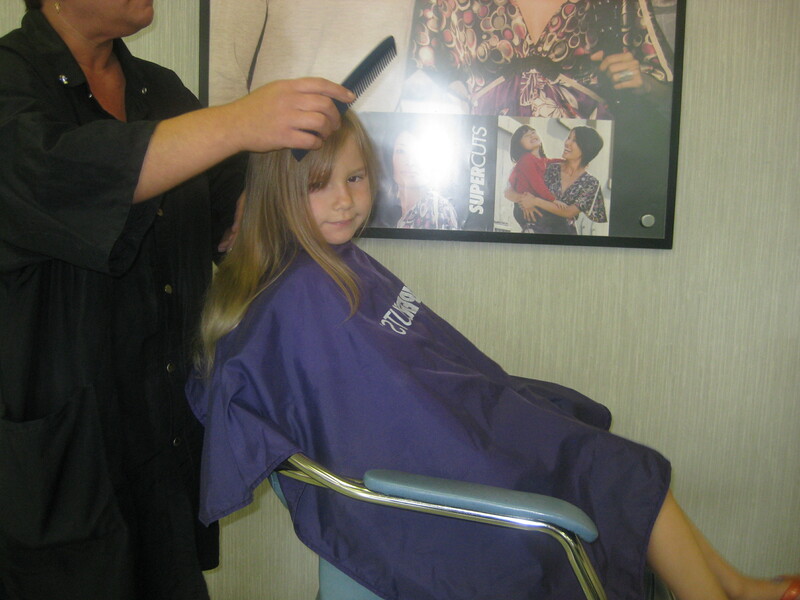 I’m almost done with school supply shopping, and everyone (but Ally) got haircuts. Kristyn will be in 8th grade at the new Junior High for Bridge School. Melissa is starting full day Kindergarten at Bridge Elementary School (she did go to full day preschool last year too). Ally will be in the 3-4 yr old class at Stock School (attending with both me and a nurse each morning for now). 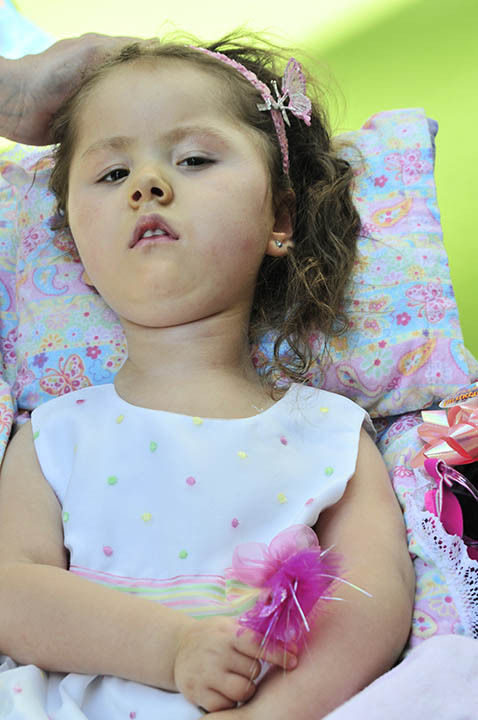 Each day Ally has the option of school or a homebound teacher. We hope to be able to go to school often at the beginning of the year (will stop about Nov-March), but will have to see how things go with germs and Ally. Our September schedule for nursing is pretty bare due to vacations and personal things for our nurses. I’ll just take it one day/week at a time and plan around what works best for Ally. I may need a little help with picking the older girls up from school with all three at different buildings, but I’m sure it will all work out. 1) On Labor Day, September 7th is the MDA Jerry Lewis Telethon. We will attend the Family Hour around 11 am and might be on TV again. I also hope to maybe answer telephone call donations this year. Let us know if you see us on WGN 9. 2) On Saturday, September 26th is the Chicago MDA Stride & Ride. If you are considering making a donation to the MDA, maybe you will join or sponsor the Ally’s Angels Team. 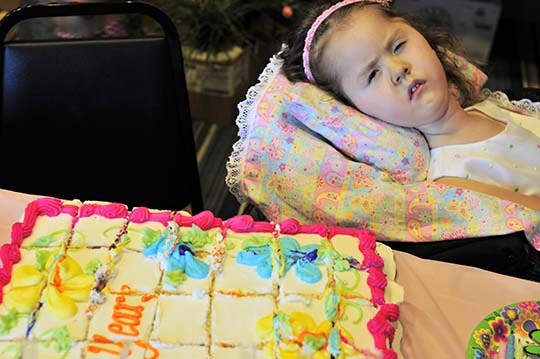 Every donation brings us one step closer to a CURE for SMA. Be sure to see the letter I wrote to family and friends about the Walk. It will be attached to my email and is a separate page on Ally’s website www.AngelAlly.com (tab at the top of home page). To join our team and/or make a donation, go to https://www.joinmda.org/chicagozoowalk2009/AllysAngels. 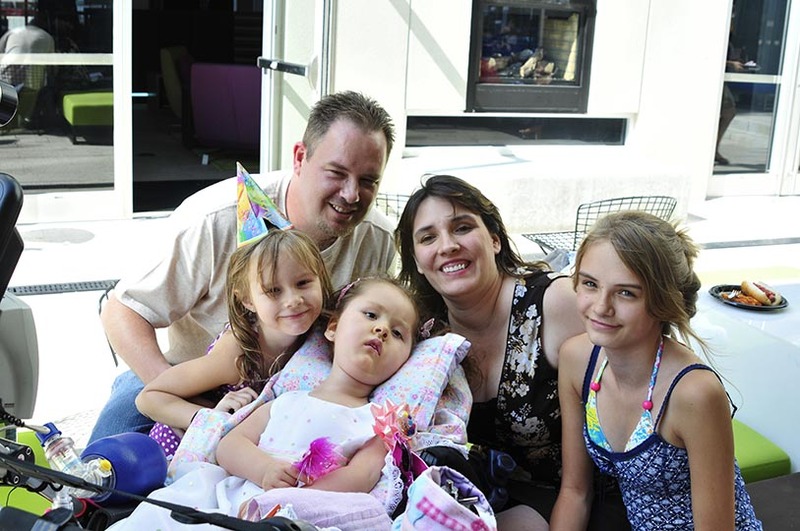 Please keep in mind – Our family now participates in 2 walks each year (one for MDA and one for Families of SMA). Some of you have also donated to the Angel Allyson Fund NFP. We do not expect you to donate to all of these, but please know that we really appreciate your continued prayers and emotional support. Thank you. Hope you enjoyed this update and new pics. Be sure to leave a comment on Ally’s website to let us know you visited.